A friend introduced me to Glad Rags about three years ago. I had a whole shelf of disposable, feminine, hygiene products. With six daughters I didn’t want to run out of the stuff. For under $200, each girl now has a lifetime supply of reusable feminine protection. That saves our family a bunch of money. I love the products. They work better and are more comfortable than disposable products. If you couldn't go to the store to buy disposable hygiene products you'd be "glad" to have these "rags". Save 20% on all Glad Rag products. If you decide to get the complete kit you’ll save an additional $12.00. The Moon Cup provides comfortable internal protection for women with latex sensitivities. This soft, silicone menstrual cup collects the flow rather than absorbing it, so the vaginal tissues aren't dried out as they can be with disposable tampons. The Moon Cup holds up to an ounce of fluid and should be emptied several times a day; simply rinse and reinsert. Detailed instructions come with your order. The Moon Cup can last up to ten years, saving you over $800 in disposable products! 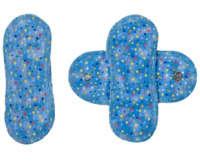 For your light days or for everyday use, the Cotton Color Pantyliner offers comfort and protection! Measures 6 3/4" long by 2 3/4" wide when snapped around your underwear. Holders are made out of comfortable cotton flannel fitted with a snap and “envelope” for the inserts. 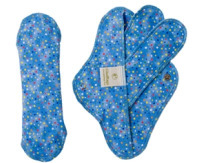 Inserts consist of super-absorbent terry cloth and flannel for maximum protection. Lasting for years, Glad Rags are easy on your budget, while also using minimal resources. Turn your pad over. Snap it around your underwear. The tag side goes next to your underwear and the smooth side goes next to your body. Sleep a little easier with the maximum protection and comfort of a Night Pad! 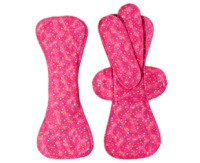 Reusable Night Pads are longer and wider to provide more coverage while you sleep. In addition to extra coverage, the night holder contains a layer of ultra-absorbent terry cloth. On the go? 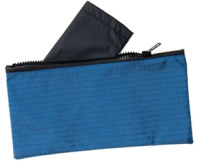 Convenient Carry Bag makes changing your GladRags away from home a breeze! Each soaking bucket is made up of: a 1-gallon bucket (white or clear), a 2-gallon bucket, and a lid. The smaller bucket fits inside the larger bucket. 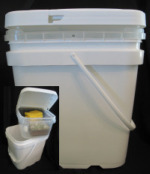 Store your clean items in the top bucket and soak your soiled items in the bottom bucket.